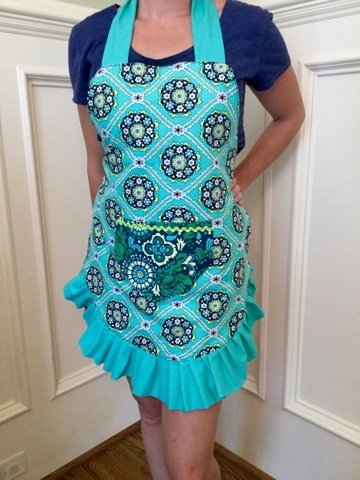 I have been wanting to make the flirty apron by the dating divas for a long time but have not been inspired enough to take the time to sew one until now with my small group, a sweet bunch of women who enjoy celebrating each other! 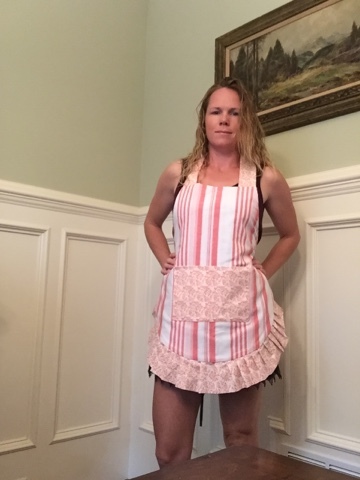 With one of the birthdays this week being for a gal in our group who is particularly mind blowing creative and is always baking and hosting, this apron tutorial popped in my mind! She is always doing special, amazing, creative thoughtful thing for others. I followed the apron tutorial pretty closely the only change I made was that I made it reversible with coordinating fabric on the reverse side and used the fabric from each side as the pocket fabric on the opposite side and I changed the pocket shape on one side for variety and added some Rick rack instead of the pocket ruffle. This friend has dark hair and looks great in jewel tones and I think green and dark blue look great on her so I scoured Joanne's and had a couple other options picked out that were okay and once I had settled on some other fabric, I got lucky and after thinking I had seen everything, found these fabrics on my way to the cutting counter which I had missed! So glad my 3 year old distracted me or I wouldn't have seen them. 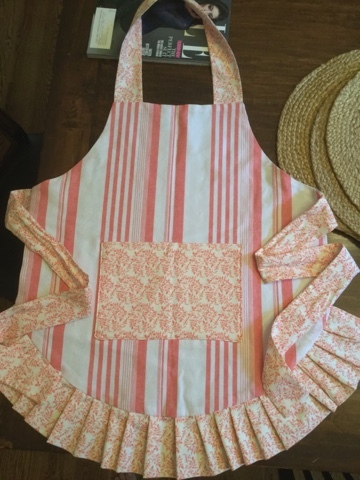 Here are some pictures of the apron process as I followed the instructions and added the reversible detail. Pattern cut out with contractor paper I have. My friend is taller so I added an inch in length to the dimensions given in the tutorial. 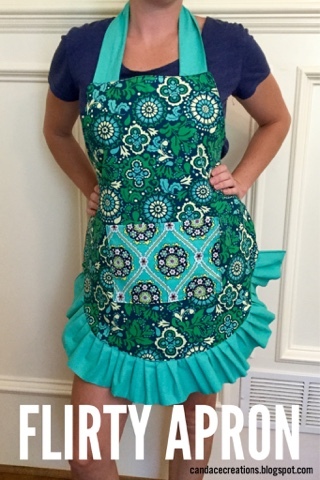 Fold fabric in half and line up pattern on fold and cut out two coordinating aprons. A little note that my newly turned 7 year old dropped by after I let him have some of the fabric scraps to tie around his head like a ninja. All the pieces cut out according the the dating divas tutorial with the addition of an extra apron and pocket. I decided to switch it up and not do a ruffle on the pockets. One side is the rectangle pocket and the other side I cute it to be rounded and added the Rick rack detail along the top. Also my fabric for the bottom ruffle was not long enough, so I cut out two strips and then sewed them together to get the needed length. The. I ironed the Rick rack o. And wrapped around the edges, and pressed with the iron. This is temporary and doesn't hold it but it held it in place enough to sew it on. Then did the same process with the rectangle pocket for the reverse side of apron. Cut on folded fabric and top of pocket is the folded edge and then sewed around raw adages and left an opening to turn right side out. To get the pocket placed right I folded the apron in half to find the center then lined up the pocket with the center and pinned it in place on only the top layer of fabric, then unfolded and pinned the other side down flat and top stitched around the sides and bottom of pockets. Both pockets are now sewn onto the aprons. Next, follow the instructions on the original tutorial by making the bottom ruffle. Sew the neck strap and waist ties inside out leaving ends open and then turn right side out. Carefully pin everything in place. The bottom ruffle will need a good amount of pins to keep the ruffle edge and apron edge lined up. This is all pretty much just following the if aging diva instructions so far. But then...take your reversible apron and lay it face down on top of everything thou just pinned. Carefully line up the edges especially along the bottom ruffle and pin everything good so it all stays in place. Sew all the way around your apron leaving an opening on the side, make sure the opening isn't where any straps or Ruffles are attached. You can see my opening below, it's below the waist strap and above the bottom ruffle. Make sure to back stitch the when you start and finish and I also back stitched over the neck straps and waist ties to make it strong. Carefully flip the whole apron right side out through that opening. Now let's close the opening. Fold in the open edges to match the seam and press with iron. Sew that opening shut but top stitching over the ironed seam you just did. I did a small zig zag stitch and decided to keep going all the way around the apron for a little added detail. Such a fun sewing project! I haven't been motivated to sew for a long time but this project got me excited to get it all out and make something. The dating Divas did a great job with the tutorial. 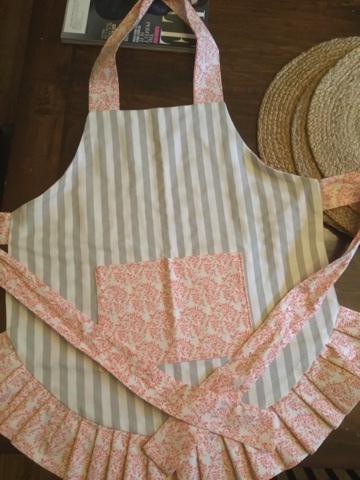 I remember once buying an easy apron pattern and it was labeled quick n easy. It took me like 8 hours because the patty was so confusing! I would much rather use an on,one tutorial than a store bought pattern anytime possible. 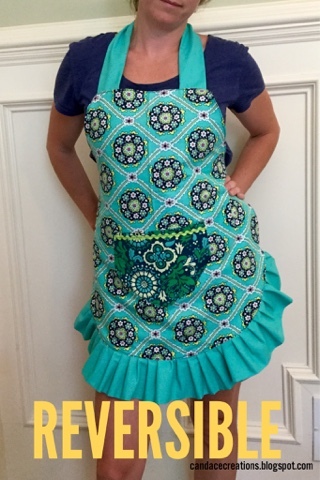 And now you can take that great apron tutorial and make it reversible! Double the fun!